If your group is looking for a book to study, this is the one! It's language is accessible, the length and format digestible, and each historical citations entreats you to find out more. All this, combined with the invitation to examine our own psychology, congealed mental paradigms, and social relationship to power, politics and religion make this a critical read for anyone hoping to do coherent Muslim-Christian interfaith organizing for effective and profound nonviolent social change in the coming years. ‘The Jihad of Jesus is a manual for waging jihad. And make no mistake; Dave Andrews wants you to wage jihad. Not the violent jihad of extremists; but a ‘strong yet gentle nonviolent struggle’. Dave's model for this is Jesus: the jihad of Jesus. Drawing on the teachings of both Christian and Muslim scholars and faith examples from both traditions he presents Jesus as the supreme example of jihad. This is challenging stuff. Dave does not shy away from the litany of horror perpetrated in religions name. But just as you want to turn away and scream ‘enough!’ Dave leads the reader towards a deeply compassionate and nonviolent reading of jihad, teachings which are found in the Qur’an as well as the Bible. 'I have been involved in interfaith work for eighteen years now, and one thing I have learnt along this journey is that, in order to build genuine coexistence, inter-faith must go beyond merely speaking politely to one another or simply leaning about one another’s faith - it must involve compassion. Compassion is a “higher conscious-ness” humanising the “other”. It is truly wanting for our brothers and sisters what we would want for ourselves. "Jihad is a much abused term but most Muslims know that the greater Jihad is not to use force but to use what Gandhi called 'Soul force' to resist temptation and evil. In The Jihad of Jesus, Dave Andrews gives us some important and tested observations on the sources of violence and both the reason and the means for resistance, and he does so by drawing on the wisdom of both Muslim and Christian scholarship and experience. Dave Andrews books come from the heart but also from open and hard-working hands: from his own experiments in compassionate resistance to the violence of this age. For purposeful interfaith engagement with the world as it is I very much recommend this book." ‘The Jihad Of Jesus is not the jihad we are used to hearing about! It has been hard to keep my heart kind while I have been a part of Christian Solidarity Worldwide, advocating for persecuted Christians, usually at the hands of some Moslem group somewhere. The book is very challenging. It speaks to both Christians and Moslems jointly and examines what might be the causes of our frequent enmities, asking whether they are caused by our faiths or by self-centredness. It “confesses” past sins of both groups, starting with the Christian ones, and then it offers things we can do together in a determined way to change ourselves and those around us without swords and violence. It is also carefully showing how Jesus’ radical teachings give us the blueprint for this Jihad. ‘I can think of no book ever written anywhere - popular or scholarly - that so effectively does three things: 1) Recounts the dark side of both Christianity and Islam, 2) Explores the positive potential for peace in Christianity and Islam, and 3) Shows how the teachings of the Christian savior and Muslim prophet Jesus can make a difference in today's world. Brian McLaren - Pastor, Activist and Author of "Why did Jesus, Moses, the Buddha, and Mohammed Cross the Road?" I turned on the television the other day to hear a Christian American say: "Our enemy is Islam and our enemies are Muslims!" Disturbed by his tone, I shifted to my computer, where I opened the Internet only to see an equally alarming message from a British Muslim: "Islam must crush Christianity, the false religion!" These men are from different religions, but their motives are strikingly similar: oppress those who do not think as they do; use violence, if necessary, to put down other faith groups; and never consider the beliefs and practices of other religious communities to be valid or useful to society. Needed now more than ever is a new manual for Christian-Muslim relations which does not resort to name-calling, exclusion, and violence. "The Jihad of Jesus: The Sacred Nonviolent Struggle for Justice" (Wipf & Stock, 2015) is a compelling new book which calls on Christians and Muslims to embrace the peaceful example of Jesus and unite in a strong yet nonviolent movement to counter bigotry and violence. Dave Andrews, the author, is a peace activist, community organizer, theologian, and facilitator of harmonious coexistence among human beings. He is a Christian in the purest sense. Andrews believes "all people are loved, equally, by God, regardless of color, class, caste, or creed." It is this egalitarian spirit which oozes out of the "The Jihad of Jesus." While Andrews acknowledges the theological differences between Christians and Muslims, he intentionally tries to "focus on those beliefs about [Christ] that Christians and Muslims have in common as the place for [them] to start [their] conversations." Andrews sees "'common ground' not as suspect compromise, but as 'sacred ground' on which [they] can stand and speak to one another." The common ground on which he wants Christians and Muslims to meet is one based on justice, love, and peace. He requests that Christians move away from their arrogance and aggression and Muslims to embody the compassionate and merciful spirit of Islam as exhibited in thebismillah, the Arabic phrase meaning "In the name of God, the merciful and compassionate." Andrews posits that Christians and Muslims must reflect the kindness and humility of Christ, who they should follow "with every beat of [their] hearts, through every vein in [their] head, and [their] hands, and [their] feet." 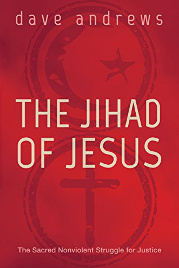 "The Jihad of Jesus" is anchored in the theory that Christians and Muslims erect impenetrable boundaries around their communities in order to exclude people who they perceive as being different from their co-religionists. Andrews argues that by constructing these barriers, Christians and Muslims show symptoms of hatred and fear. This kind of "closed perspective" towards religion, he claims, is harmful because narrow-minded people tend to be dogmatic, judgmental, and intolerant of dissent. Andrews challenges "religious fundamentalists" to open their hearts and minds and turn away from their "unchanging and unchangeable" ideologies, which leave no room for diversity, disagreement, and interfaith encounters. Following the example of Jesus, Andrews prefers an "open perspective" towards Christian-Muslim relations because it replaces cold-heartedness and hard-headedness with warmth and compassion. According to him, the "open perspective" fosters inspirational personal growth and transformational social change by opening people up to positive elements of other religious traditions. In doing so, Christians and Muslims leave behind the "ideology of religious supremacy," and acknowledge the "mercy of God," which clears the way for Christians and Muslims to heed Jesus' call of tearing up prejudices and trashing stereotypes of others. ... it is absolutely vital for the future welfare of the human family that [Christians and Muslims] examine [their] frequent utter disregard for human rights, diabolical persecution of unorthodox traditions and heterodox religions, and total destruction of "infidels" in genocidal "Holy Wars" waged in the name of our "great God." Here Andrews offers practical and spiritual guidance by reminding Christians and Muslims to engage in the ever-important process of self-reflection. The time is ripe for Christians and Muslims to find their "inner-Jesus" and accept the call of non-violent revolution. As Christians and Muslims continue to encounter each other in the future, it is crucial for them to remember that God does not favor any particular group of people simply because they call themselves "Christians" or "Muslims." All of us need to move away from the idea of our religious tradition having a monopoly on the truth. This is one of the key messages of Andrews' philosophy. "The Jihad of Jesus" will inspire you to work alongside your Christian and Muslim brothers and sisters in the struggle for mutual understanding and genuine peace. After all, this is our shared jihad.